The EU referendum debate is raging on (I took delivery of a rather large Vote Leave poster a few days ago) and numerous public debates are popping up in halls, pubs and even on the street in some cases. 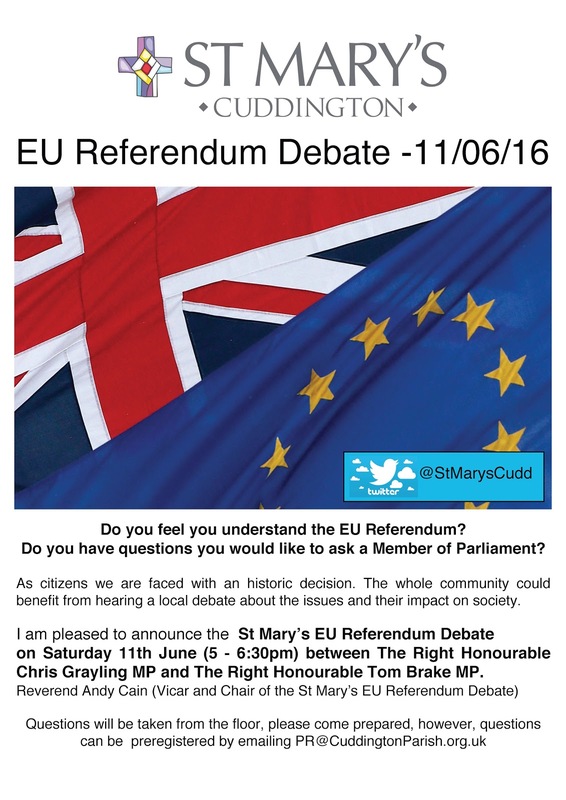 On Saturday the 11th of June (around a week and a half away - assuming you're reading this around about when it was published) St Mary's Church are playing host to one official such debate where Lib Dem Europhile MP Tom Brake will debate Conservative Eurosceptic MP Chris Grayling - all chaired by the Reverend Andy Cain (whose church it is). Both will be answering your questions. I hope lots of people will attend this to hear both sides of the argument, rather than the project fear currently being rolled out. I have noticed that when people get a chance to listen to both sides of the argument properly it tends to result in more people moving towards the Leave side so seeing as that's where I am, I'm very much in favour of big comprehansive(ish) debates like this. Incidentally if anyone wants to help campaign for a leave vote - please contact Melissa who is a local organiser on melissa4leaveeu@gmail.com.